On a breezy afternoon in the seaside city of Kayar in Senegal, El Hadj Abdoulaye Ndoye sits with a group of other retired fishermen waiting for the boats to come in. The sea is calm, but Ndoye, 80, isn't optimistic. 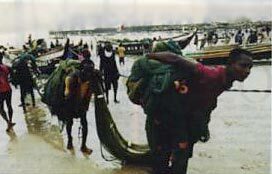 With fish increasingly scarce, boats have had to stay out for longer stretches, sometimes days at a time, chasing octopus off the nearby city of Mbour or venturing into the waters of neighboring Guinea, Sierra Leone and Mauritania in search of grouper, sea bream and hogfish. The wait is troublesome for Ndoye because he's hoping to receive a part of his "pension"--a portion of the younger generation's daily catch, as recompense for the instruction their elders gave them years ago. Kayar fishermen use a method that entails dragging a hundred meters or so of fishing line, with numerous baited hooks, from the back of a small wooden boat. 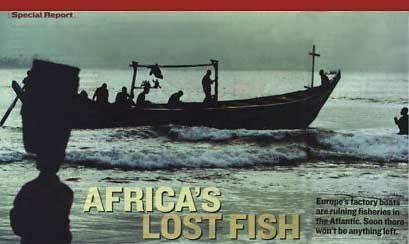 Fisheries have been in decline the world over, and the waters off Western Africa are no exception. In recent years, stocks have declined steeply. The reason is the same everywhere: too many boats chasing too few fish. But this time it's not the local fishermen who are causing all the trouble. The problem is European ships like the Atlantic Dawn, the pride of the Irish fleet, which weighs 14,000 tons, measures 145 meters from stem to stern and requires a crew of 100. Its nets are big enough to encircle at least half a dozen football fields and, on a good day, take in 400 tons of small fish--sardinella and horse mackerel. A single trip can bring in a haul worth more than $2 million on the wholesale market. Some 250 "factory" ships from Europe and elsewhere are now trawling the waters off Mauritania, and hundreds more fish in other areas off the West African coast. Ships like these have already depleted the North Sea and the northern Atlantic, and now they are doing the same in southern waters. Thanks largely to Europe's policies, some of West Africa's fisheries are heading for collapse. By all accounts, fish have been declining at an accelerating pace. A United Nations report earlier this year found that the catch of octopus--much prized in Western Europe--off the Mauritanian coast has been halved in the last four years. Sawfish have disappeared completely. Since the late 1970s the quantity of "bottom fish"--shrimp, squid, hake and others--has been halved along the coastline of the six countries south of Morocco, according to the World Wildlife Fund. "In terms of overfishing, the situation is as bad as in the North Atlantic," says Daniel Pauly, a fisheries expert at the University of British Colombia, who was responsible for the study. "There is no justification whatsoever for exporting Europe's surplus fishing effort." If the West African fisheries were to collapse, the consequences would be severe. Experts point to the fate of Newfoundland's cod stocks, which have still to recover a decade after the fishing grounds were closed. In West Africa, most people rely on fish for the lion's share of their dietary protein. Scarcity has already been felt. 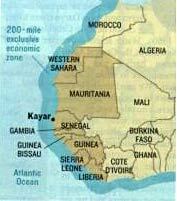 In 1997 Senegal produced 453,000 tons of fish, but by 2000 production had declined to 330,000 tons. A few years ago the national fish-and-rice dish, thiebou dienne, was made almost exclusively with grouper, but now people make do with sardines. Jobs in the fisheries is down by 50 percent from a few years ago, according to the United Nations. The streets of Kayar, a once prosperous fishing town with fancy brick buildings, is now virtually empty of young men. Those who haven't left town are out in the boats searching for fish. "We used to leave the village at 9 a.m. and come back at 1 p.m. with enough fish," says Ndoye. "Now you can spend two days in the wild and come back with an empty bag." The $500 million that Europe will pay Senegal for the rights to fish its waters from 2001 to 2006 will no doubt come in handy. Like many of its neighbors, the country has few salable assets and depends on the EU cash to help pay down some of its overseas debts. The EU's fishing policy has caused twinges of conscience. Some lawmakers have called for reform, but that's not likely to happen soon. 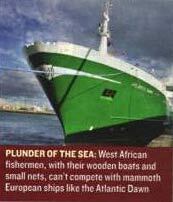 Proposals to cut the size of the EU fishing fleet in its own waters have run into tough opposition. Spain, which operates the EU's largest fleet and receives the lion's share of EU aid ($555 million last year), says reform would cost 20,000 jobs in the Spanish fishing industry. Meanwhile, the price of fish has skyrocketed; cod has risen threefold in the past decade in Britain. Europe's response has been to subsidize the cost of new boats, which find their way to the coast of West Africa. Already, more than half of the fish that reaches European dinner plates comes from foreign waters.